Reviewing movies from unfamiliar cultures can be challenging. I’ve been watching Japanese movies and shows for long enough that I have at least some context for films like Organ . 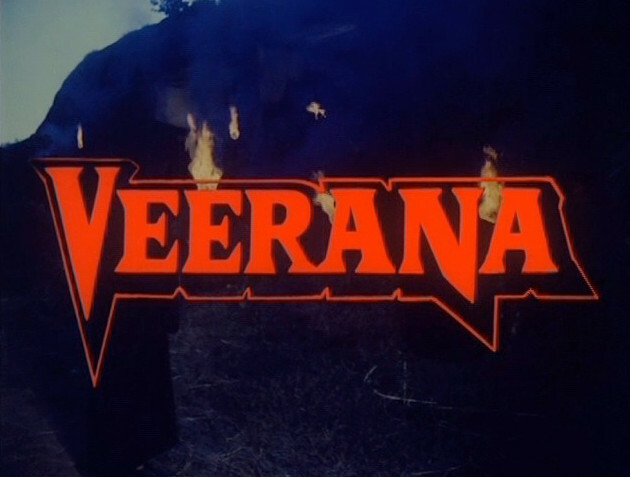 India is a large country with many distinct and separate regions, and watching only a small number of Indian movies in no way provided me context for Veerana . Therefore, for this review I will assume that anything I find weird, confusing, or off-putting is a result of my own ignorance. 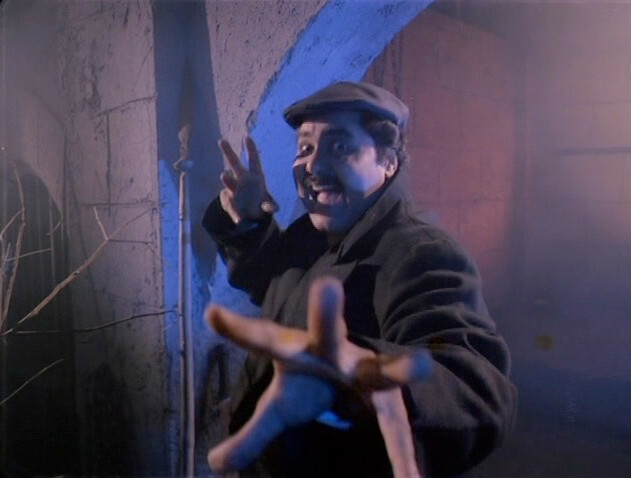 The beginning of the movie is sort of like Vampire Circus , in that it serves as a mini-narrative to set up a monstrous revenge. Here we’re introduced to a Thakur — a position of importance in the town — and his family. The English subtitles make a hash out of the relationships, so I apologize if I get any wrong. 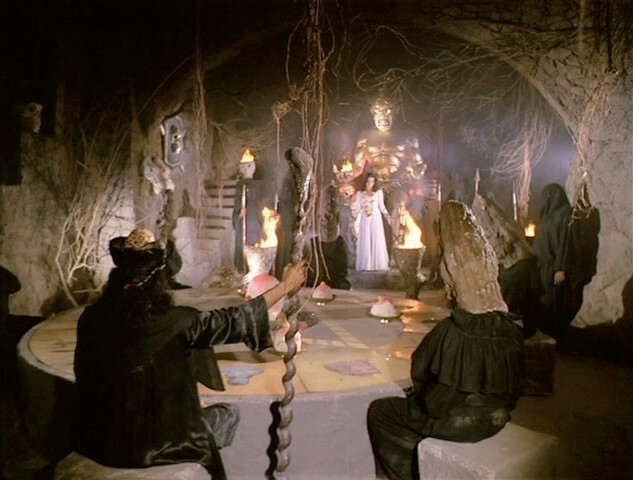 There is a witch lurking in the woods, and Sameer (Vijayendra Ghatge) — brother of the Thakur — uses a holy relic called an AUM to bring her to justice. Nakita (Roy Kamal) is hanged for her crimes, but her followers retrieve her body. They then waylay Sameer and his niece Jasmin on the way to her school. Sameer disappears, and Nakita’s soul is transferred to Jasmin. 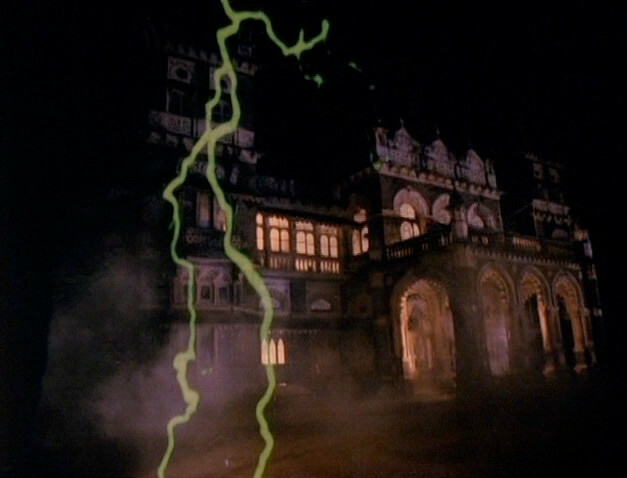 Nakita‘s mansion, the night Sameer comes to capture her. That’s a high-level summary. The set up is pretty involved, and by the end of it Sameer’s wife has been killed by Jasmin, leaving their daughter Sahila an orphan. A wizard, who leads the cult of Mahakal that tends to the witch, winds up becoming Jasmin’s protector as Baba (Rajesh Vivek). All of this and more having been established, the movie jumps forward in time to begin the story of dark vengeance. Dark vengeance and more than a few musical numbers. Sahila (Sahila Chaddha) comes to visit her uncle, only to discover that Baba plans to restore the witch to her own body through the sacrifice of Jasmin (er, Jasmin). It’s going to take help from the Thakur, a wannabe director, a hunky guy she met on the road, and a perverted servant for Sahila to save her cousin. I genuinely found the comic-relief character entertaining. This is a comedy, at least whenever the film-buff is onscreen. That’s when the humor is most broad, at any rate. It may be my warped sensibilities, but I find a lot of the film to be humorous. Not in a “now they’re singing haha” way, but because the movie knows when it’s being silly. There are serious parts as well, but the overall experience is one of a goofy good time. I basically live for shots like this. This appears to be a low-budget affair, but it’s one with good production value. The witch makeup is fun, if not convincing, and there’s a terrific set where all the cult stuff happens. I was never sure if the people chanting around the circle were wearing morel-shaped masks or were mushroom-headed demons, but they certainly caught my attention. Everything about the cult’s dungeon lair is awesome. I’m glad I watched Veerana . Despite being unfamiliar with the culture, language, or cinematic context, I enjoyed it on its own terms. It’s a bit of a romp, outright silly in places, and even if you don’t really care about the characters the evil they’re fighting is entertainingly outrageous. I’ll have to see if I can find more films from India to expand my sample size, but from my limited experience this is one I recommend.